May | 2012 | Teachers Act Up! Incredible artwork by Jim Woglom! I love to take my courses into public life and meaning–this summer, I am a lucky professor who gets to work intensely with creative educators on the craft, practice, and possibilities of poetry! Whether they become a poet or simply immerse themselves in the life of a poet for a week–no matter! What matters is the collective experience of advanced creativity and lyrical meaning making. How we each translate this experience into our lives as teachers, researchers, poets, and community members will be a creative act of living! 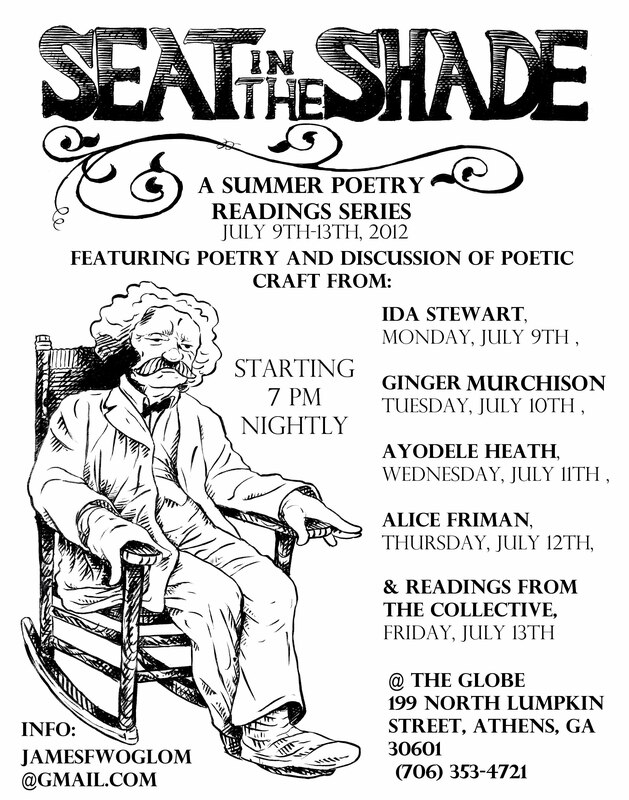 We will culminate our course with a July readings series “Seat in the Shade” with some of the best published poets in Georgia who will share their words and wisdom with us every evening at the Globe July 9-12. Our course will culminate with a reading from our “collective” of creative poet-educators on Friday July 13. Please join us in spirit or person this summer! See the line up below…! Just got word this morning that Feminine Ending, a sonnet written in fall alongside my amazing students, was just published in the May issue of the Cortland Review, audio file included! Yeah! One’s skin get’s quite thick through piles of rejection letters. A sweet balm to see a poem come to life in ‘web print’!